This is the final post of 5 written by various CHC HealthCorps Navigators about their efforts during AmeriCorps Week 2013. 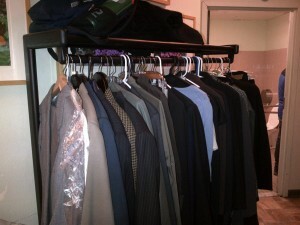 Marsha Pierre wrote this piece about a Career Prep Fair at Norwalk Open Door Shelter. 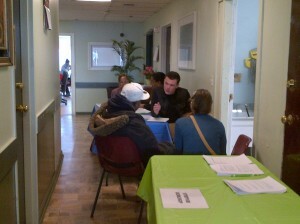 The HealthCorps Navigators and Day St. Community Health Center hosted a Career Prep Fair for the public at the Open Door Shelter, located in Norwalk, Connecticut, on Thursday March 14th. The fair, held in honor of AmeriCorps Week, was intended to help the unemployed in Norwalk gain the tools that they need and to boost their confidence as they try to become part of the job force. This fair was only made possible by the generous businesses and organizations in the Norwalk area who graciously donated their time and resources. Because of them, we were able to offer the unemployed an array of services, including career counseling, resume building, mock interviewing, free interview clothing and manicures. Norwalk Community College (NCC) brought in Recruitment and Placement Coordinator Erik Rambusch and Associate Director of Admissions Curtis Antrum to shed light on career advancement opportunities. Rambusch started off the fair by performing a career assessment exercise to the entire shelter. With the help of six HealthCorps Navigators, Rambusch went over an assortment of career options based on each participant’s personality types. Antrum then shared a motivational speech with the group and encouraged the participants to explore continuing their education with NCC. 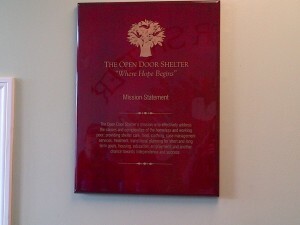 We also had resume building and interview workshops set up within the shelter. Navigators were able to give practical advice on interview etiquette and on how to interview successfully. After that they had a practice session with the participants using “mock interview” questions to help the participants practice their new interviewing techniques. 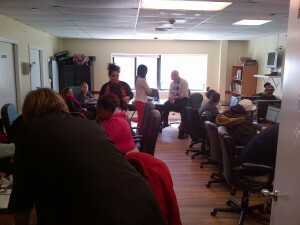 Navigators also helped participants draft new resumes. Many of the participants had resumes made before, but kept losing them, so we opened up new email addresses and sent them a digital copy. This way, they will always have access to their resume, and they can also send out their resumes through job search websites online. In addition to distributing clothing items appropriate for job interviews, we were able to extend our participants’ confidence by providing them with free beauty demonstrations. Total Look Academy, a cosmetology school located in Southport, brought in 6 students that volunteered their time and materials. The students were able to give free manicures and demonstrated to the participants appropriate make-up techniques that they could use to prepare for a job interview. I hope that the Job Prep Fair will soon become a tradition in the Norwalk community so we can continue to help the unemployed gain the confidence and tools they need to find employment. Again, none of it would have been possible without help and donations from the Open Door Shelter, CHC HealthCorps Navigators, NCC, Person to Person, and Total Look Academy. Thank you all for making the fair such a success!